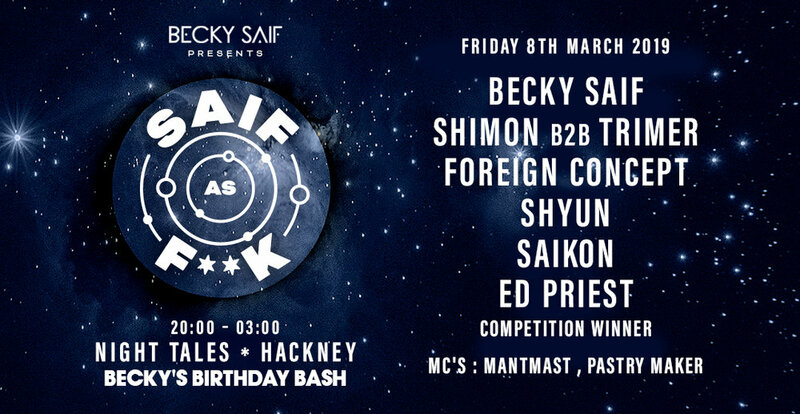 Becky Saif is bringing her DnB affair Saif As F**k to Night Tales in March. One of the rising talents in the drum & bass scene. A Together resident at Amnesia Ibiza in 2017 - supporting the likes of Chase & Status, Andy C, Sub Focus and Wilkinson. An unstoppable force, her flair behind the decks is rapidly generating interest from the Drum & Bass community. Expect high energy, insane vibes, incredible people and a line-up of carefully selected talent. Full lineup to be announced.